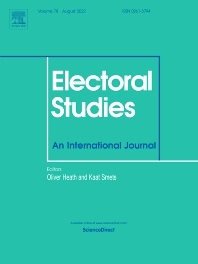 Electoral Studies is an international journal dedicated to the study of elections and voting in different parts of the world. With a reputation established over more than 35 years of publication, Electoral Studies is widely recognised as a major journal in the field. It publishes theoretically informed and empirically robust research on all aspects of elections, and provides a forum for the analysis of topics such as turnout, voting behaviour, campaigns, political parties and electoral systems, amongst many others. The recent emergence of new democracies in many parts of the world provides a wealth of new information, and scope for testing hypotheses. On specific topics of particular interest to the community, the Journal accepts collections of 4-6 short articles that form special issues. Electoral Studies permits the publishing of short notes and papers extending or replicating previous empirical findings. All articles are subject to "double blind" peer review.